You’ve probably heard a lot about the benefits of making fresh food for your baby. If you’ve been wondering how to make homemade baby food, the good news is that it is much more simple than you’ve imagined. Not only will you nourish your babe with homemade goodness, you’ll also be saving a ton of money in the mean time. And yes, even the busiest mama has time to learn how to make homemade baby food, especially with the hacks I’ve put together for you. This post will take you through 3 simple subsections—what you need to know before introducing solids, easy hacks and practical tips about how to actually make homemade baby food, and recipes and food combinations to try. Feel free to start at the beginning, or hop to a particular section if that’s the info you need most. Your baby has been safely chugging along on a diet of breastmilk or formula, and is about to hit the time to add solids. First of all, don’t panic! It can seem overwhelming (and frankly a little scary) to think about starting your little one on solid foods—we’ve all been there! They are around six months of age. According to the American Academy of Pediatrics (AAP), around six months is the proper time to begin introducing solids. The AAP also advises that babies who begin solids too early are more likely to be obese in adulthood. They can hold their head up. Another major marker for a solid-ready baby is the ability to hold their own head up with properly developed neck muscles (this is when all that dreaded tummy time starts paying off!). They can sit up on their own. This ensures your baby has proper alignment for chewing, swallowing and digesting food safely. They appear interested in table food. Have you noticed your baby leaning towards your plate or opening their mouth when you pick up a fork? These are a few signs that baby is interested! Now that you know your baby is showing the readiness signs of solids, where do you actually start? Is now the time to know how to make homemade baby food? What is a good first food? There’s no definitive answer to this, as there are many schools of thought, but a great food to start with is baby cereal. The Center for Disease Control recommends parents feed their children fortified cereals like oats, barely and multi-grain rather than just rice cereal, as there is a risk for exposure to arsenic. You could also try a homemade puree as a first food—like a cooked sweet potato mixed with breastmilk or a mashed banana. Whichever food you choose, give your baby a tablespoon or two and let them explore the taste and texture. Keep in mind that baby’s tummies are very small, and it doesn’t take much to make them full! If you have a family history of food allergies, it’s best to talk to your pediatrician about how to navigate that, and if/when to introduce that particular food type. How Often Should Babies Eat Solid Foods? At the beginning, food is just supplemental and for fun. As breastmilk or formula is still the main source of nutrition for babies aged 6 months up to a year, this is a great opportunity to allow your child to be exposed to different flavors and textures. Remember, start small—an infant’s stomach is tiny! Aim for one to two ounces of food three to four times a day around six months, then bump it up to six to eight ounces of food three times a day with two snacks in between. Now it’s time to dive into the practicals—exactly how to make homemade baby food! These tips and tricks will keep your sanity and save you money, while keeping baby fed nutritious food. Many moms prefer to make baby food in bulk because it saves them from that dreaded moment where there’s no fresh baby food in the house and your child is screaming. Cooking baby food in bulk saves a lot of stress and time—you can cook once a week or once a month and have enough for your little one to eat. If you decide to go with an all-in-one system, your opportunities to make bulk baby food are somewhat limited—you are stuck with the amount of food recommended by each brand’s manufacturer guidelines. But, even with an all-in-one system, you can still make enough food for a week or more. To make homemade baby food in bulk using the all-in-one type system, make sure you have plenty of extra containers on hand. You’ll make food the same as usual, but instead of ending it with one cycle and storing in the containers that come with it, you’ll instead scoop the food into different (or additional) containers and then do another cycle. Keep going until you have the amount of food you’d like! If you are working with a blender, things are a bit simpler in the bulk sense as you can work with larger quantities. Simply roast, boil or steam your veggies and fruits of choice, puree and store. Part of the trick to making baby food in bulk is to freeze it appropriately. Before you begin cooking, make sure there is sufficient room in your freezer (yes, go ahead and eat that ice cream to make some room!). You’ll also want to make sure your baby food containers are airtight and freezer safe so the food is stored safely. Lastly, invest in some labels so you can clearly mark what the food is and the date it was frozen. Trust me, pureed broccoli and spinach look awfully similar! I like these reusable baby food labels because they can be used over and over. Ready to get to the recipes that show you exactly how to make homemade baby food? Here are 21 simple recipes and ideas that you can use over and over to nourish your little ones. Steamed sweet potatoes: steam sweet potatoes until they are soft, then add to blender with 1-2 tbsp of breast milk or formula, or more if needed. Puree until smooth. Pumpkin, yogurt and banana: this recipe is rumored to taste like a (healthy) pumpkin pie! Pureed peas: grab some frozen peas and heat them up until soft. Toss them in a blender with breastmilk or formula and water and puree until you hit a smooth texture. As your baby gets older, you can make them a little more chunky so they can experience new textures. Kale and sweet potato mash: get your little one on the kale bandwagon the easy way with this tasty mash. Mango and kale puree with ginger: this puree looks like something I would eat too! Homemade applesauce: bake apples slices with a tsp of cinnamon sprinkled on top, then puree them with a few tablespoons of water. Turkey, corn, zuchinni and chive puree: if you have some leftover turkey, you must make this recipe! Pumpkin and white bean bisque: if you’re searching for how to make homemade baby food that you can eat as well—this recipe is one the whole family will enjoy! Chicken and apple puree: chicken is super easy to puree and a great source of protein, so you might find yourself reaching for recipes like this one often. Avocado puree: mash an avocado with breastmilk or water, and let your baby enjoy. Avocado, strawberry and mango smoothie: a smoothie like this one is a great food for baby because it’s easy to digest and the cold helps soothe teething gums. Peach and cauliflower puree: this is a great first foods option that baby will be sure to love thanks to the slightly sweet peach-y flavor. Homemade baby oatmeal: did you know you can make your own baby oatmeal right at home? Carrot puree: chop and steam carrots, then puree along with the liquid of your choice. Carrots are naturally sweet, so this is a great first food option! Broccoli and potato puree: this recipe is a great way to make the move from sweet to savory. Chicken, carrot and ginger puree: if you are making chicken for dinner, set aside some to make this tasty baby food so your little one can eat right along with you. Banana oatmeal: dress up a basic baby oatmeal with mashed banana and dash of cinnamon. Butternut squash and pear puree: this recipe is a great one to make in bulk, or make alongside some squash for your own dinner. Blueberry, chickpea and rosemary chunky puree: this puree is superfood-packed and looks delicious! Baby food lasagna: last but not least, a baby food puree that you might be jealous of! So, now that you know how to make homemade baby food, which recipe will you try first? Just remember, you’ve got this, mama! 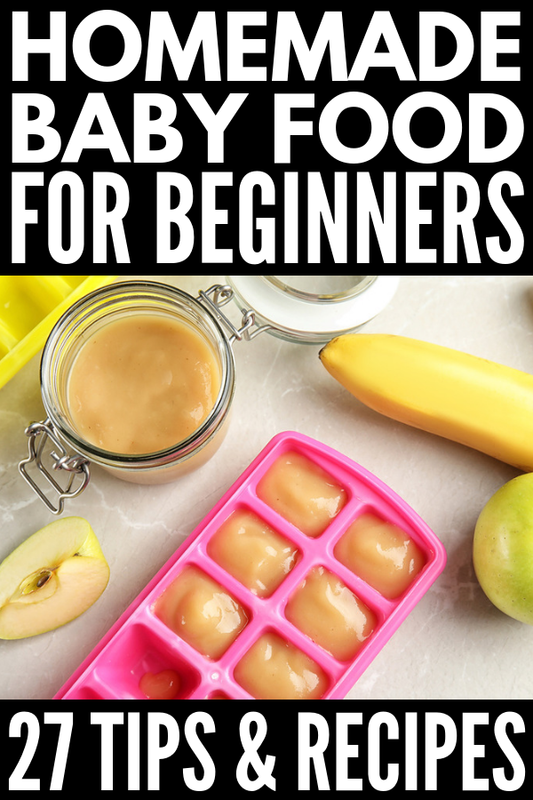 If you found this collection of tips, hacks, and recipes to teach you how to make homemade baby food helpful, please share this post on Pinterest! And if you’re looking for more parenting tips and tricks, please follow our Parenting board where we share all kinds of fabulous ideas we find each day!